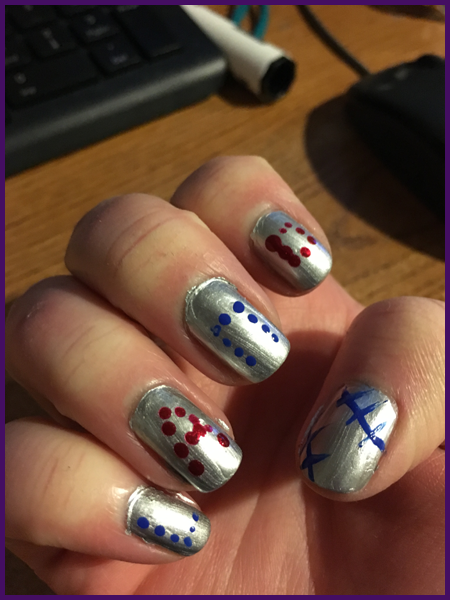 Note: I applied this polish on May 4th and took the photos on the 4th later in the day. I am a HUGE Cleveland Indians (baseball) fan. I have been my entire life. 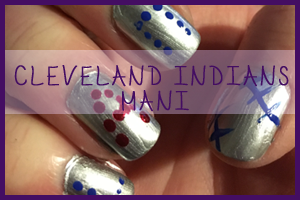 The 4th I was going to a game and decided to attempt to do a Cleveland Indians mani. I was also half asleep and needed to do it in a hurry which is why I got the result that I got, haha! My base was Silver on Ice (OPI). It is a silver frost. I did one coat as it seemed to do full coverage even if the brush strokes were pretty present. The brush strokes showing generally don't annoy me so I was fine with it. I attempted to spell out Cleveland on my fingers and on my right thumb I did a baseball stitch. I used my dotting tools and brush set that I bought off of Amazon for like $3 a few months ago. I ended up having to tape the one brush together in order to use it. You get what you pay for, right?! I pretty much failed at making the letters look like letter. 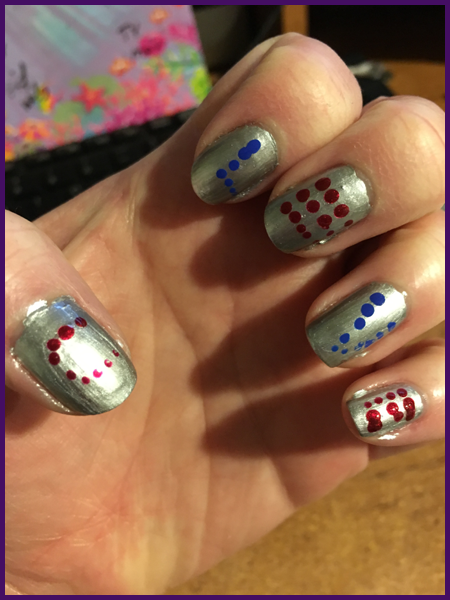 They looked more like weird polka dots. The stitch for the baseball turned out okay so I will be attempting those more in the future. For the blue dots I used Endless Blue (Sinful Colors). The red I used Sugar, Sugar (Sinful Colors). The dry time was actually pretty good. I was very sad that the silver polish chipped within a day of having it on. Perhaps it might not have with two coats, I will have to try the silver on it's own at some point. Overall I am giving this mani a 2 out of 6 stars. Fun idea, poor execution. Lol.